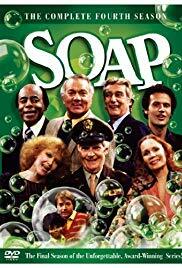 Soap is an American sitcom that originally ran on ABC from 1977 into 1981. The show was created as a night-time parody of daytime soap operas, presented as a weekly half-hour prime time comedy. Similar to a soap opera, the show’s story was presented in a serial format and included melodramatic plot elements such as alien abduction, demonic possession, murder, and kidnapping. In 2007 it was listed as one of Time magazine’s “100 Best TV Shows of All-TIME,” and in 2010, the Tates and the Campbells ranked at number 17 in TV Guide’s list of “TV’s Top Families”. The show was created, written, and executive produced by Susan Harris, and also executive produced by Paul Junger Witt and Tony Thomas. Each returning season was preceded by a 90-minute retrospective of the previous season. Two of these retrospectives were made available on VHS in 1994. The show aired 85 episodes over the course of four seasons. The final four episodes of the series aired as one-hour episodes during the original run on ABC. These hour-long episodes were later split in two, yielding 93 half-hour episodes for syndication. All episodes are currently available on region 1 DVD in four separate box sets. In the past, the series has rerun on local syndicated channels as well as on cable on Comedy Central and TV Land. It ran on over-the-air television on Antenna TV, until December 30th, 2012.